The pond is complete …you can’t miss it! Yes, it’s a pond that, at the moment, thinks it’s a reservoir …or at least that’s how it looks to me. I hasten to add, that isn’t a negative, more an observation. I’ve been holding off from writing this post in the unrealistic hope that I’d be able to accompany it with an attractive picture, but that isn’t going to happen in the near future – at least at my skill level. Having said that, the topsoil, back in place round the edges and covering the banks, is starting to green up already, specially from a distance and committee members have scattered pond-specific wildflower seed around – quite a lot in fact, but we thought it worth raiding the budget for. The great thing is that there’s water collecting in the bottom already, by now all round the island and filling the three deeper pools. I say great thing and it is, because that’s the point after all, but what none of us took into account from the beginning – and it’s one that makes me more than grumpy – is that our wildlife pond would be adopted as a handy, regular swimming pond for dogs. This was never the idea and whilst we thought it possible that one or two might flop in to cool off occasionally in future years, it simply never occurred to us that, if we put up yards of tape and clear notices asking people to stay off the area – for goodness sake, the place is big enough without it! – while soil settled and seed germinated, that people would ignore the request and any possible reasons behind it and follow their own agenda. Naive? Obviously! To be fair there have been only a few transgressors, probably not in the Friends group and who almost certainly won’t read this, but they have been regular and persistent and accompanied by the larger (and therefore more destructive) breeds. If you see if happening, please feel free to have a word, if for no other reason than to find out why they do it. Personally, I don’t get it because apart from anything else the water is grey and smelly and will be unless and until it gets deeper – probably in the cold weather when no-one, canine or otherwise – feels much like swimming. But there you are. There will always be a few who have to be different. It’s a shame because our wood is being enjoyed by increasing numbers of people, most of whom are brilliant in all other respects – picking up dog poo, pulling and cutting back thistles – but I’m guessing this will be a longer and more drawn out battle and I really don’t know how it will turn out. Perhaps a pair of particularly aggressive swans will take up residence on the island and repel all borders…. …and from the other end.. Categories: Alhampton, Haddon Wood, Pond | Tags: Dogs, Haddon Wood, Land drains, Pond, Water supply, wild flower seed | Permalink. As yet another marker of summer whizzing past, the pond construction is nearly into its third – and possibly final – week already. It seems an age since the community first put the idea forward as an adjunct to the Woodland Trust’s part in the woodland, but suddenly it’s taking shape – loud and proud. In week one you would have noticed the Friends’ warning signs, followed swiftly by the contractor’s, but you can’t possibly miss them now that the Woodland Trust have added theirs to the gates too! If, however, by some bizarre chance, you did – landing, perhaps, by helicopter – no-one could fail to see the earthworks erupting in Field 4. 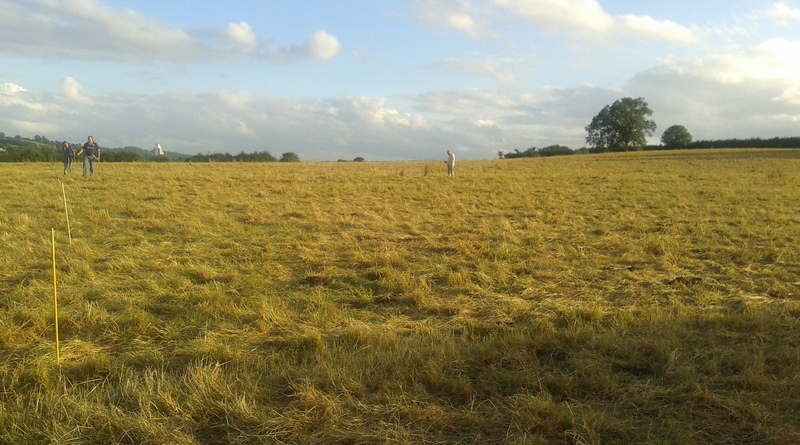 It’s going to be big – 50 x 100 metres – but not as big as the space suggests at the moment. Topsoil has been removed from a 20 metre strip all round, so that subsoil can be banked and spread, before being re-covered and re-planted. We’ve seen other, much smaller ponds that probably seemed large enough on paper, but have either shrunk over time, or been blotted out by surrounding vegetation and we wanted something that would make a proper contribution to wildlife habitat, with an island. 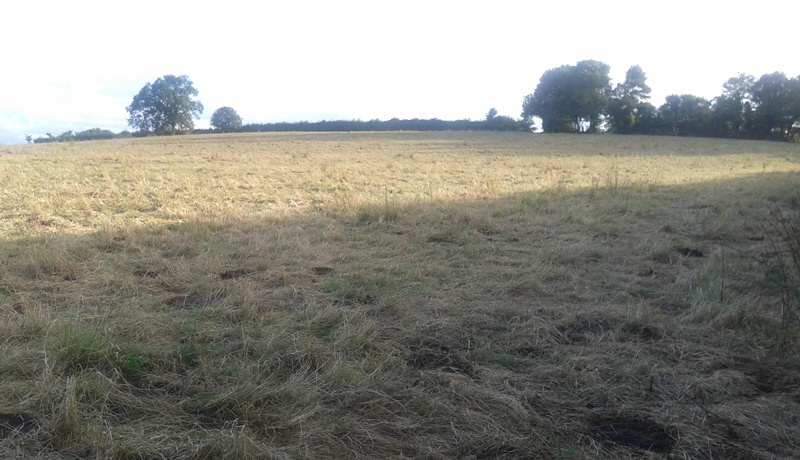 Happily it was a concept that our then Woodland Trust manager took on board way back at the beginning, although on his plan it was higher up in Field 5 (before we found the land drains) and even bigger! It’s going to be ephemeral too, so probably will only hold water for the wettest months of the year and yes, it won’t be so pretty for the first year or two, but it’s amazing how quickly grass – and other things – will creep into the space and we’ve got two hundred more trees waiting to go in below the Eastern rim, when conditions are right in the Autumn. So, our biggest project yet and one we’re immensely proud of. I’m no expert, but I know bad ground works when I see them and Mark has pulled off quite something by identifying one of the most proficient and hard-working teams I’ve come across. Yet again we’re lucky to have so many knowledgeable, helpful locals to get stuck in to help with Haddon. Week one’s mysterious heaps in are beginning to make sense, the island has taken shape and there’s even a dribble of water in the bottom! Categories: Events, Haddon Wood, Pond | Tags: clay, Haddon Wood, Land drains, Pond | Permalink. Mark found a gap between rain showers last Friday and hired a mini digger to… well, do some digging. 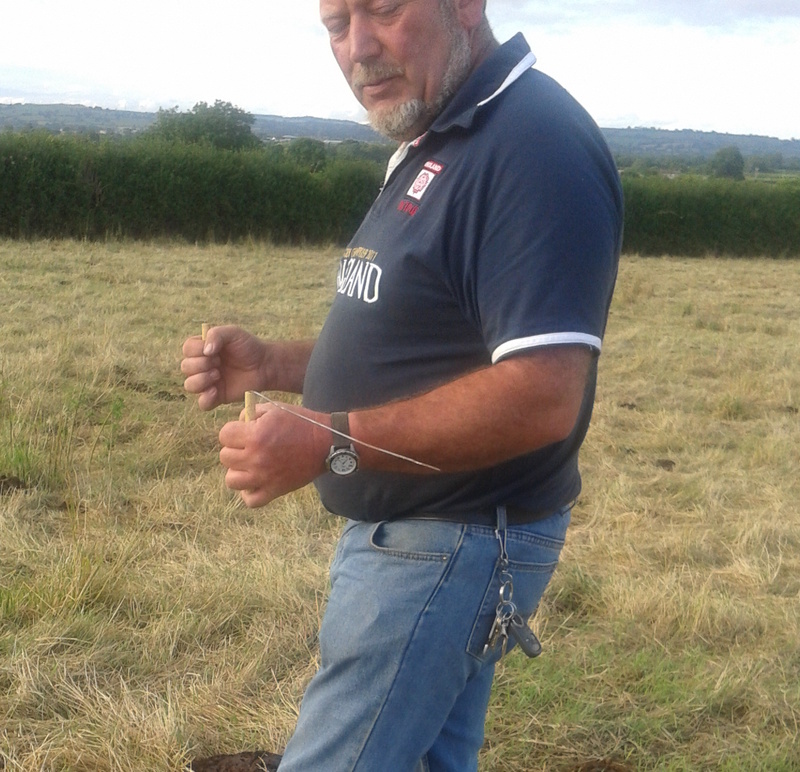 It was a serious exercise, not just a boys and toys thing – though I don’t remember that any women drivers present were offered a turn – but we needed to find the land drains we’d been told about and that Richard had found during the divining episode. By the time I got there Mark had already dug two short trenches (thanks to Network Rail for closing the A371…) and was well under way with the third. The first bit of good news is that he cut drains about 3 metres apart, at a depth of about 3ft and water was actually running out and puddling in the bottom of the second trench by the time I got there with my camera; the second, that between 2 and 3ft down he found the heavy grey/black stuff that we love to hate. Now the only thing we have to worry about (and I never thought I’d say such a thing) is that the clay seam is broad and deep enough for our needs! Quite a lot of useful stone turned up. Categories: Alhampton, Haddon Wood, Pond | Tags: clay, Land drains, Network Rail, Pond | Permalink. …as an episode driven by both curiosity and need. The necessity was obvious. We want a pond and as the people responsible for digging it, it’s up to the Friends to find the best spot – and fast – before the next phase of tree planting in December. I’m repeating myself, but we know now that fields 4 and 5 were very damp before land drains were put in 40 or so years ago to make the land farmable (is there such a word?). OK, so we could get a digger in to drive a trench right across the field to find the clay seam, but that would mean Insurance and Risk Assessments, as per the Woodland Trust’s rules, not to mention the disruption to the land and almost inevitably, money changing hands for the diesel at least. Even if we weren’t still waiting for the Bank to get its act together and actually give us the account we applied for months ago, it kind of goes against the grain to spend anything we don’t have to from our precious resources. The curiosity got its nose in quite by chance. 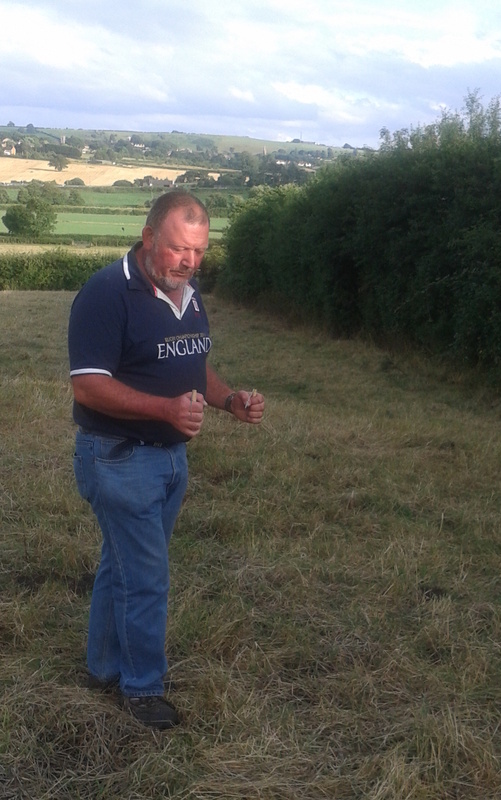 It turns out that a man I’ve been working with for well over a year, Richard, Somerset born and bred, is a water diviner along with his many other country talents – and it was too good an opportunity to miss. Fate, in fact. Two birds with one stone etc etc …and I wasn’t the only one to think so – everyone on the committee wanted to see him at work too. So we set off across the dessicated tussocks in search of a water source, armed with nothing much except some sort of road pins for markers. It doesn’t look promising in the first picture, I’ll admit – and the ladies in the bovine maternity ward around us, clearly thought we were insane. 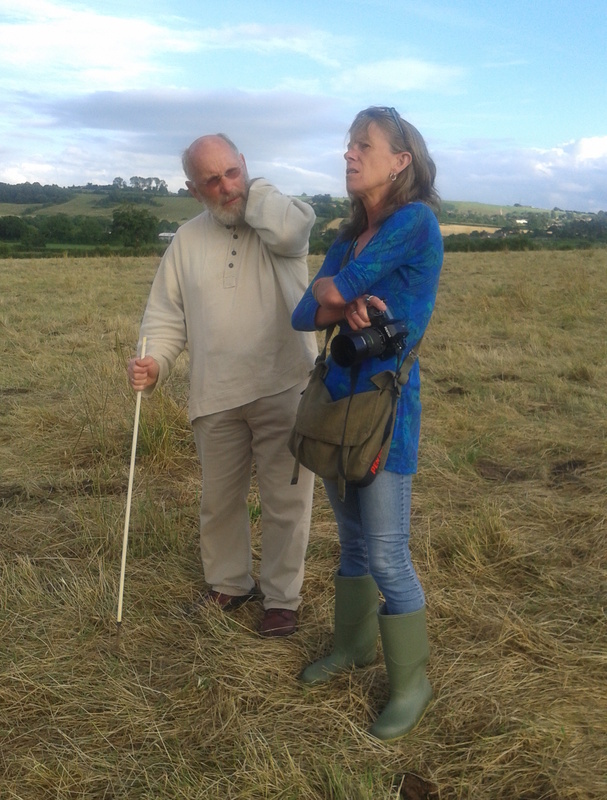 They batted long eyelashes at us, raised eyebrows at each other and with one accord (in the mysterious way that cows have) without discussing it, took themselves off to another area of the field. I was expecting Richard to be wielding a forked stick, cut from the hedgerow – it must have been something I saw on Blue Peter when I was a kid – but he produced a couple of pieces of what looked like wire coat hanger slotted loosely, at right angles, into plastic tubes that he held, …and that, apparently, was all there was to it. At the bottom of the field he found a straight line that we decided was the water supply running to the trough where fields 4 and 5 meet. We knew roughly where that had to be, but it was reassuring to have it confirmed and fascinating to see what happened to the rods when he was standing over the pipe and then turned away from it. The find didn’t help with pond location though, because the WT wants to remove piped supplies to avoid being liable for maintenance. We tried the original area that Jon from the WT had drawn on the plan, because he found a variety of wild flower that grows on damp ground but we found …nothing. So we worked our way up to the top of the slope, which is where things started to happen. There’s a small hawthorn tree in the hedgerow towards the top corner and whenever Rich got near it the rods kept trying to pull him in there. If he walked away, they kept looking back longingly to where he’d just been. Eventually we dragged him – and them – beyond that spot to start checking the land from the top of the slope downwards, to where we were increasingly beginning to believe would be the ideal spot. Rich kept up a steady pace throughout. He didn’t cheat by looking where he was going, or by listening to the (lots of good) advice he was getting, but simply quartered the ground, pacing quietly along, watching the rods and following where they seemed to lead. That’s not to say that they were moving constantly. For longish stretches they simply hung there, doing nothing – but that’ s what makes the process as fascinating as it is. When they felt there was something to do, they sprung into action and what more could you ask? Long story short – we think he found the series of land drains running straight down the slope from below the old hunt jump in the hedge (top right of the first picture). Standing looking down the slope, with the grass beaten down by the maternity crew, it seemed to us that there’s a slight, but definite natural indentation in the ground about half-way down field 4, towards the boundary hedge to field 2. I’m not saying it’s already deep enough for a pond, but that it seems a natural place to enhance. Not only that, but once the drain lines are cut, there should be a natural flow to fill the pond more quickly than simply hitting clay and waiting for the heavens to open. Sceptics would probably say that water diving (or divining of any kind) is a load of old hooey, but those little pieces of wire don’t know that and they just got on with what they know best: pointing, in parallel, in the same direction when they got near a water source; pointing in opposite directions over a pipe and – though we didn’t see it because if there is one, it’s over the hedge at the top – whirling round and round when they find a spring. What I can say, having seen it in action, is that things are looking pre-tty promising. All this happened at the end of July. There’s no excuse for taking so long to write it up, except Summer is such a great time for …well, outdoor-type things and by the time, since then, I’ve been ready to sit down at the computer in the evenings , something else has intervened – like sleep. The drought has broken in the meantime. The parched fields have greened up again and we’re back to the sort of weather we’re more used to: sunny bits interspersed with cloudy/rainy bits, warmth, humidity and the odd shiver. ‘They’ say we haven’t seen the last of the good weather yet, though, and personally I’ll take as much sunshine as I can get, for as long as it lasts. It’s bad enough that sunset has already crept forward to 8.26pm (tonight – I checked) without autumn setting in already. PS I think my pictures are even worse than usual on this post, for which I apologise, but hopefully it’ll give Rose even more incentive to add her professional ones – particularly now she’s got a new computer! Categories: Events, Haddon Wood, Pond | Tags: dowsing, Land drains, Water divining, Water supply | Permalink.